SOLD OUT! Our April Seminar in Brea is Sold Out. Please contact us today if you would like to sign up for the August Seminar! Join IKONICS Imaging in BREA, CALIFORNIA ON APRIL 12-13, 2019. IKONICS Imaging's two day sandcarving seminar, taught by Darin Jones and Mike VanOvermeiren, is designed for basic to intermediate skill-levels. Not only will IKONICS Imaging cover computer and artwork training, IKONICS Imaging will be going over the full sandcarving process from A to Z. Starting with artwork, then film and processing, next is application and technique, then finishing with the final sandcarved product. >> Day One Topics: Cover live computer and artwork training along with photoresist film application. Dinner entree on IKONICS! We hope you join us. >> Location: Media Blast & Abrasive, Inc.
>> Day Two Topics: receive hands-on training and sandcarve a wide variety of substrates at the Media Blast & Abrasive, Inc. facility.Learn multiple sandcarving techniques including; stage-carving, halftones, color-filling techniques and much more. Experience top-of-the-line sandcarving machines with experts in the industry. You don't want to miss out! Important Information: for more information on the seminar location and lodging, Click Here and scroll to the appropriate event! 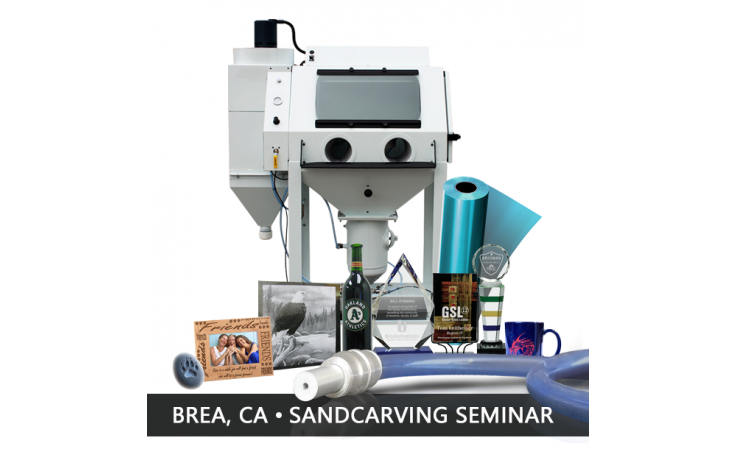 The Sandcarving Seminar in Brea, CA cost is $100 per person and covers both days of class. Upon completing your online order, you'll be receiving a separate registration confirmation email within 24 hours. If you need to cancel for any reason, receive a full refund through Friday, March 15, 2019. Cancellations after 3/15/19 will not be refunded.